Episode 004 of the Response Point Podcast will be recorded via live conference call on Tuesday 11/9 at 7pm eastern time. I am planning on doing a one-on-one chat with Richard Sprague, of the Microsoft Response Point Team. 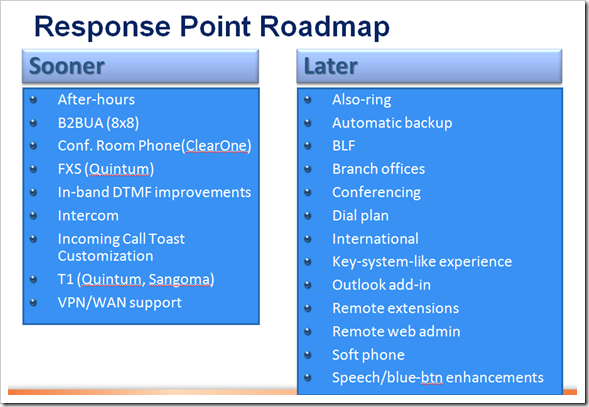 During our talk I will quiz Richard on several items included in the 2 next waypoints on the Response Point Roadmap that was discussed recently in the Response Point Town Hall Meeting. This episode will be conducted via public conference call. You are invited to call in. During my one-on-one chat with Richard the lines will be muted. After we cover the planned material I will unmute the lines for anyone interested in asking questions or making comments. To access this conference call - dial (can anyone really DIAL anymore?) 1-218-486-1616 and enter 30961 for the access code. This conference call will be recorded and available for download and podcast here and in the iTunes store.